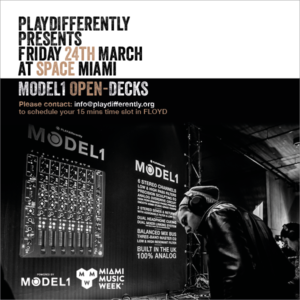 PLAYdifferently invites Space Miami ticket holders to test the MODEL 1 mixer in a club environment at our first Open Decks event. Please bring your USB’s, CD’s or vinyl and experience the power of MODEL 1 on Club Space’s sound system. Contact info@playdifferently.org to schedule your 15 mins time slot in FLOYD.